Packed at locations where gluten, peanuts and nuts are handled. May contain the occasional stones/pits from fruit. These sweat breakfast balls are made with pitted dates, gluten free oats, almonds, strawberries and natural vanilla flavouring. 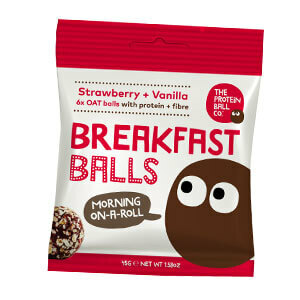 Rolled in gluten free oats, the Strawberry + Vanilla breakfast balls have a lovely crunch due to the pea protein crispies. A great breakfast snack with a cup of tea or coffee, on the way to the office, or after your morning workout. Made from a handful of ingredients including raw pitted dates, gluten free oats, hazelnuts, cacao nibs, cacao powder and pea + rice protein. 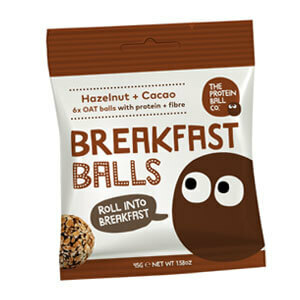 Rolled in gluten free oats, these indulgent Hazelnut + Cacao breakfast balls are perfect with a cup of coffee or if you want a healthy alternative to chocolate. These oaty balls of goodness are made with a sweet handful of raw pitted dates, gluten free oats, apples + blueberries with vegan rice, pea and pumpkin protein. Rolled in cinnamon and gluten free oats, these nut free breakfast balls have a fruity taste with a interesting zing. 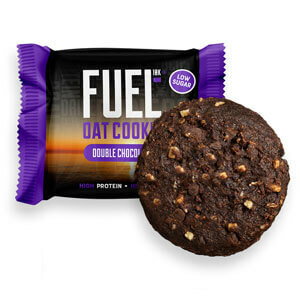 Great for breakfast on-the-go, after your morning run or at your desk at work. This Oomf! 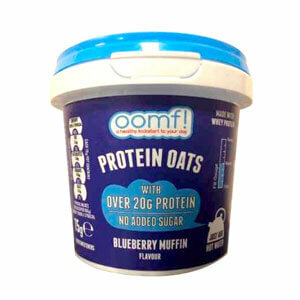 Blueberry Muffin Instant Porridge is about to transform your breakfast time! 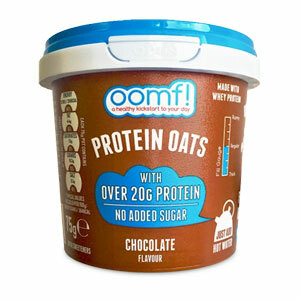 Each pot is made up of a unique blend of oats, whey protein concentrate and natural flavours, with an impressive 20g of protein per 75g serving. Liven up your morning routine with the Oomf! Baked Apple Pie Instant Porridge Oats. 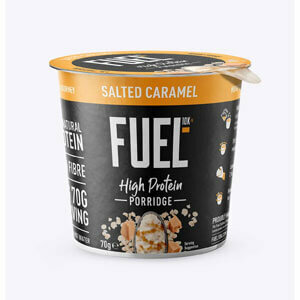 Each pot combines oats, whey protein concentrate and natural flavours, packing 20g of protein per 75g serving. 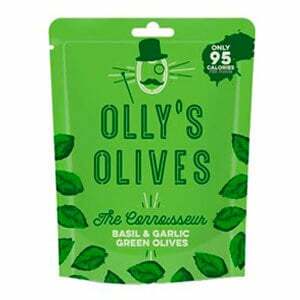 Great for on the go, just add water and stir before tucking in. Oats Flakes, Skimmed Milk Powder, Whey Protein Concentrate, Raisins, Xylitol, Cinnamon Powder, Natural Flavouring. 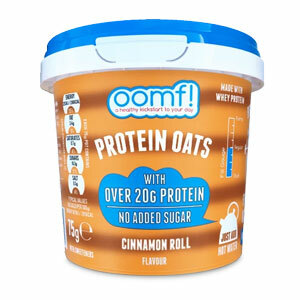 Start your day with a nutritious protein hit thanks to this Cinnamon Roll Protein Oats porridge from Oomf! 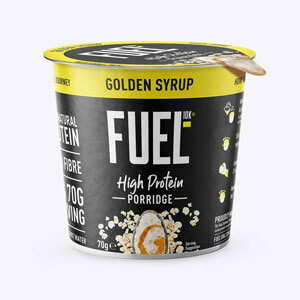 Each pot combines a unique porridge recipe made of oats, whey protein and natural cinnamon roll flavour for a delicious, indulgent breakfast. Water, Wheat Flour, Milk Protein, Wheat Protein, Egg White, Rapeseed Oil, Agents: (Di sodium di phosphate, Sodium carbonate), Emulsifiers: (Mono- and diglycerides of fatty acids, Polyglycerol esters of fatty acids), Salt, Starch, Preservative: Potassium Sorbate, Acidity Regulator: Citric Acid, Enzymes, Sweetener: Sucralose. Hands up who LOVES pancakes… Yep – us too, so that’s why we’ve taken the fuss out of your breakfast by creating these fantastic, ready to eat, protein packed pancakes! 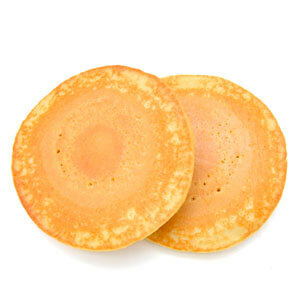 YES – each 2 pancake serving of these fluffy PROTEIN PACKED! Water, Wheat Flour, Milk Protein, Wheat Protein, Egg White, Rapeseed Oil, Raising Agents: (Di sodium di phosphate, Sodium carbonate), Emulsifiers: (Mono- and diglycerides of fatty acids, Polyglycerol esters of fatty acids), Natural Flavouring, Blueberries, Salt, Starch, Preservative: Potassium Sorbate, Acidity Regulator: Citric Acid, Enzymes, Artificial Sweetener: Sucralose. Water, Wheat Flour, Milk Protein, Wheat Protein, Egg White, Rapeseed Oil, Raising Agents: (Di sodium di phosphate, Sodium carbonate), Emulsifiers: (Mono- and diglycerides of fatty acids, Polyglycerol esters of fatty acids), Natural Flavouring, Salt, Starch, Preservative: Potassium Sorbate, Acidity Regulator: Citric Acid, Enzymes, Sweetener: Sucralose. 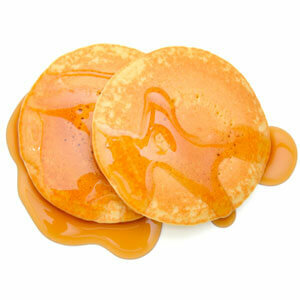 Add a little no fuss protein goodness to your mornings with our delicious ready to eat, High Protein Maple Syrup flavoured Pancakes - +11g protein! 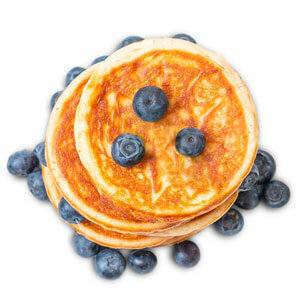 Outstanding nutritionals aside, unlike some other dry, dense and flavourless ready made protein pancakes you can buy, ours are light, fluffy and typically American style. Egg (66%), Water, Whole milk, Starch, Rapeseed Oil, Salt, Xanthan gum, Citric acid, Lactic acid. 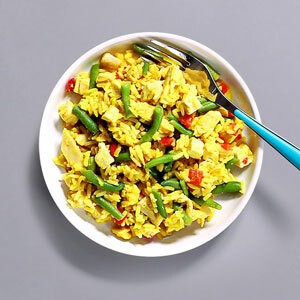 Start your day off right with these incredible pre cooked scrambled eggs! 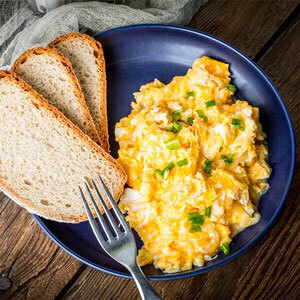 Available in handy pouches, these delicious scrambled eggs will provide your bod with an epic 9.9g of muscle building, muscle maintaining and satiating protein per serving. Not to mention the abundance of micronutrients packed into each and every yolk… Vitamin D anyone? Boiled eggs (weight class 5). 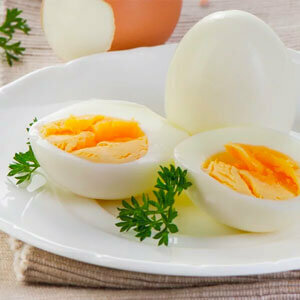 These hard-boiled eggs are a fab way of maintaining your protein levels throughout the day when you’re in need of a quick fix. Ready boiled, ready peeled and hand packed in convenient packs of two, these delicious eggs will provide your body with a 12g of natural protein per serving as well as several healthy vitamins. 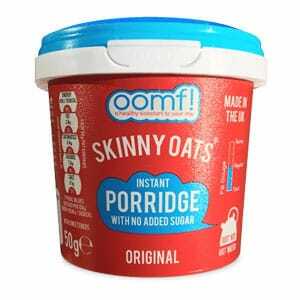 Tired of plain old simple porridge? You need to try this! FUEL10K have Pimped it up by adding super tasty flavours to their porridge helping to make those early mornings a bit more enjoyable! Made with 100% Natural ingredients of rolled oats, plant proteins, natural sweeteners. Packed in an environment that handles Gluten, Crustaceans, Eggs, Fish, Peanuts, Soya, Milk, Nuts, Celery, Mustard, Sesame and Sulphites. 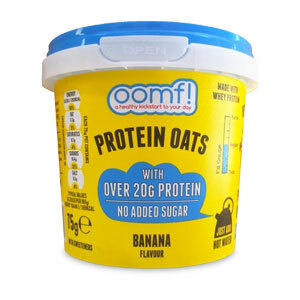 Each 75g pot is made up of a unique formulation of oats, whey protein concentrate and natural flavours, and contains a whopping 20g of muscle building protein! It’s also a rich source of essential amino acids – ideal to help aid the growth and recovery of your muscles – and has just 3.3g of fat per serving. Each 75g pot contains 20g of protein - due to the addition of whey protein concentrate – and just 3.3g of fat with no added artificial sweeteners. It’s also low in sodium and a deliciously rich source of amino acids – essential in the maintenance and growth of your muscles. Oat flakes, skimmed milk powder, whey protein concentrate (Milk) (15%), xylitol. 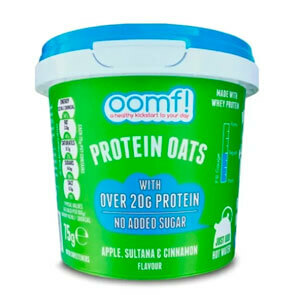 If you like your oats plain, simple and packed with protein, you will LOVE Oomf's brand NEW Original flavour. 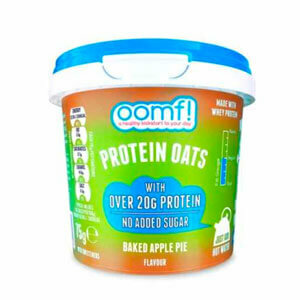 Each 75g pot contains over 20g of quality protein! Rolled Oats (72%), Xylitol, Coconut Milk Powder (6%), Brown Rice Protein, Pea Protein, Roasted Peanut Fines (4.5%), Peanut Nibs (4%), Sea Salt, Natural Flavouring. Tired of plain old simple porridge? You need to try this! FUEL10K have Pimped it up by adding super tasty flavours to their porridge helping to make those early mornings a bit more enjoyable! Made with 100% Natural ingredients of rolled oats, plant proteins, natural sweeteners and Crunchy Peanut pieces. Tired of plain old simple porridge? You need to try this! 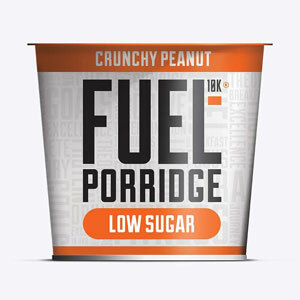 FUEL10K have Pimped it up by adding super tasty flavours to their porridge helping to make those early mornings a bit more enjoyable! Made with 100% Natural ingredients of rolled oats, plant proteins, natural sweeteners and Golden Syrup. Gluten Free Oats (29%), Rice Syrup, Vegetable Oils (Palm*, Sunflower, Coconut, Rapeseed), Soya Protein Crunchies (Soya Protein, Tapioca Starch, Salt) (17%), Soya Flour, Raw Cane Sugar, Salt & Natural Flavourings, *Sustainably sourced. Ideal as a snack when you’re on the go or as a quick breakfast, this delicious bar is made with wholesome gluten free oats, soya protein crunchies for a satisfying flapjack with a subtle crunch. Oaty, crumbly with a sweet and wholesome taste, this flapjack gets its hearty texture from the protein-packed soya crunchies and gluten-free oats. 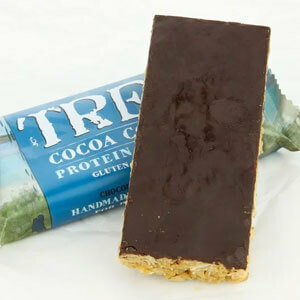 Real coconut chips are crammed together with wholesome gluten-free oats and protein crunchies before being topped with a layer of dark chocolate, resulting in a unique and satisfying taste with a tropical twist. Gluten Free Oats (20%), Rice Syrup, Soya Protein Crunchies (15%) (soya, tapioca starch, salt), Dark Chocolate flavored coating (13%) (sugar, palm oil, cocoa powder, emulsifier: sunflower lecithin), Vegetable Oils (Palm, Sunflower, Coconut, Rapeseed), Raisins (9%), Soya Flour, Raw Cane Sugar, Salt, Natural flavouring, Cinnamon & Nutmeg. 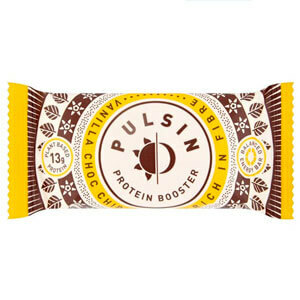 Packed with 9g of plant-based protein (soya) and crammed with wholesome ingredients including juicy raisins, gluten free oats and a dash of cinnamon for added yum. It’s also wheat free, transfats free, GM free and vegan friendly. 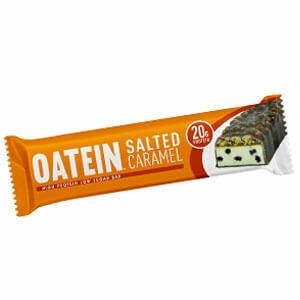 The Oatein Low Sugar Protein Bars are the ideal way to power your muscle growth while enjoying a sweet treat. 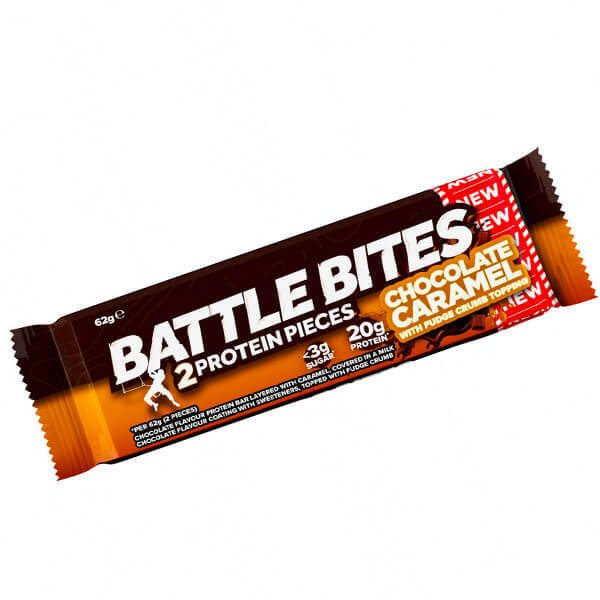 Each bar is filled with 20g of protein, sourced from milk whey and Soya for a soft, creamy texture, then packed with toppings and coated with a generous layer of smooth flavoured caramel and a thick layer of chocolate. Protein blend (32%) (milk) protein, soy protein, hydrolysed wheat protein [glutamine peptides]), humectant (glycerine), oat flour, rice maltodextrin, maize maltodextrin, palm oil, white chocolate chips (4%) (sugar, cocoa butter, whole milk powder, emulsifier [soy lecithin], flavouring), fruit pieces (2%) (fruit [concentrated apple puree, strawberry puree], fructose-glucose syrup, sugar, humectant [glycerine], wheat fibre, palm oil, acidity regulator [malic acid], gelling agent [pectin], concentrates [black carrot, blueberry, pumpkin], natural flavouring), raising agents (sodium bicarbonate, cream of tartar), gum acacia, flavouring, sweetener (sucralose). 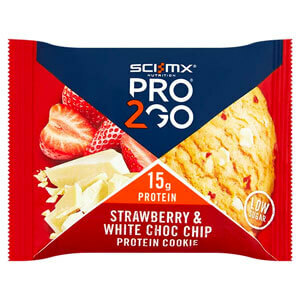 If cookies are your thing, but you’re trying to be good, then you HAVE to check out this amazing PRO 2GO® Cookie… LOW in sugar, HIGH in protein and bursting with slow release carbs for sustained energy. 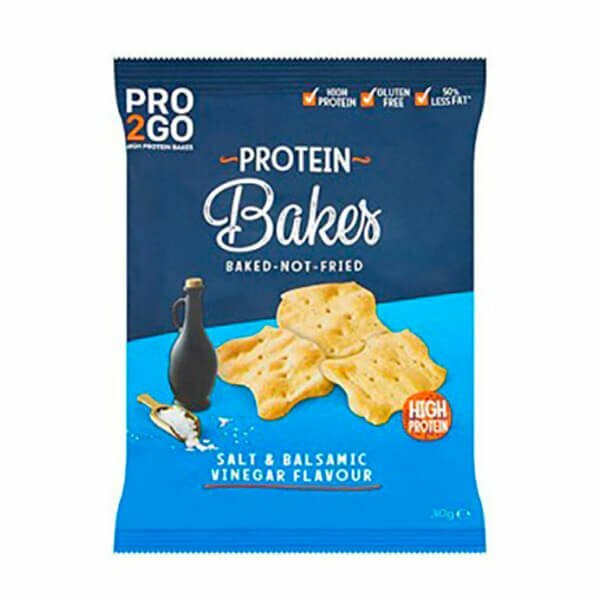 High in protein, low in sugar, guilt free and brimming with taste bud tickling deliciousness, these super convenient nibbles are ideal for upping your nutritious protein intake anytime, any place. PLUS, they’re GMO free, contain no hydrogenated oils and are smothered in craving busting low sugar milk chocolate for a truly decadent protein bite indeed. High in protein, low in sugar, guilt free and brimming with taste bud tickling deliciousness, these super convenient nibbles are ideal for upping your nutritious protein intake anytime, any place. PLUS, they're GMO free, contain no hydrogenated oils and are smothered in craving busting low sugar milk chocolate for a truly decadent protein bite indeed. 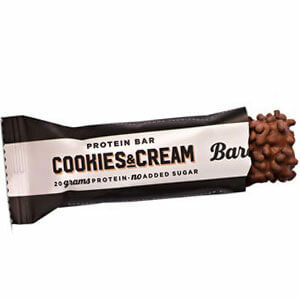 Protein blend (textured soy protein, soy protein, milk protein); white chocolate coating (20%) (sugar; cocoa butter; whole milk powder; emulsifier: soy lecithin; flavour); fructo-oligosaccharides (chicory root extract); sweeteners: maltitol, sucralose; fructose syrup; soy nuts; glucose syrup; vegetable oil; humectant: glycerin; flavours; emulsifiers: soy lecithin, mono- and diglycerides; acidity correcting agents: malic acid, citric acid; color: turmeric. Crammed with 15g of protein derived from a premium blend of soy and milk protein along with just 17g of carbs and a high 4.4g of fibre. This delish bar is smothered in lush white chocolate, has a lovely lemon tang and has a super satisfying crunch thanks to the addition of rather cheeky rice crisps. Protein blend (textured soy protein; milk protein; soy protein; hydrolysed gelatin); polydextrose; oligofructose (chicory extract); vegetable oils(palm kernel, palm and shea oils, sunflower oil); emulsifiers: glycerin, soylecithin, mono and diglycerides;cocoa powder(2,7%); coconut flakes (2,3%);cocoa butter;coconut cream (0,6%);flavours; salt; sweeteners: sucralose, potassium acesulfam. 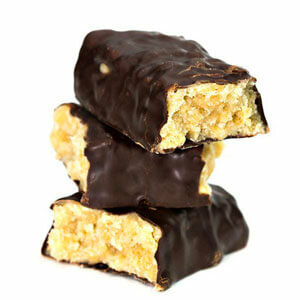 Each 45g bar contains only 14.6g of carbs, which could be up to 3 times less than the protein bars you may be using. Milk protein Milk chocolate with sweetener(sweetener [maltito], cocoa butter, whole milk powder, cocoa mass, cocoa powder, emulsifiersoy lecithin], flavour), isomaltooligosaccaride, hydrolysed collagen, humectant (glycerol), water, sweetener (maltitol syrup), dietry fibre (polydextrose), rapeseed oil, cocoa butter, protein crisp (whey protein [milk], rice flour, emulsifier [soy lecithin]), salt flavour, cocoa powder, emulsifiersoy lecithin], sucralose]. 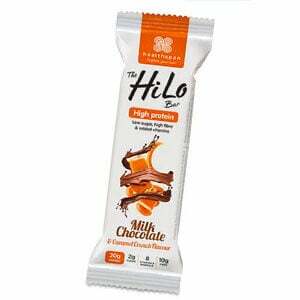 Treat yourself to this great tasting liquid centre peanut & milk chocolate high protein bar. 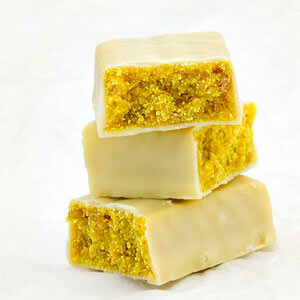 Delicious fusions of flavour coat every ounce of our high protein, low sugar bars. Perfect for those who refuse to compromise on taste! 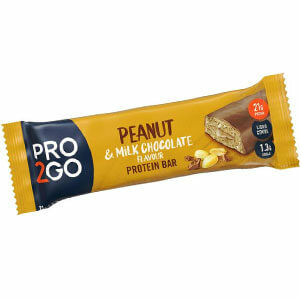 With a smooth liquid centre you’ll be surprised to learn they’ve got 21g of protein per bar, along with being low in sugar & carbs you’ll be able to snack guilt free on our tasty bars. 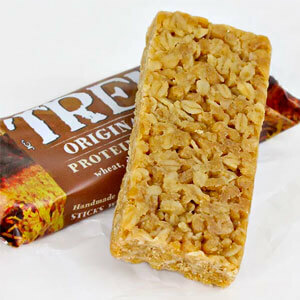 A premium range of protein bars containing a unique blend of pea and rice protein to provide you with all of the essential amino acids your bod needs to perform at - and look - its best! 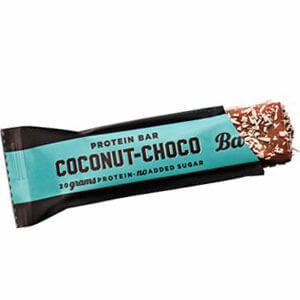 Yes folks, these bars give you the most perfect protein boost you could possibly wish for having been made with 100% all natural ingredients, NO refined sugar and top grade plant based proteins. May contain egg, milk products, nuts, peanuts and sesame seeds. Milk Protein Prep. (Milk Protein, Whey Protein Concentrate [Milk], Soy Lecithin), Dark Chocolate Flavoured Coating Prep. (14%) (Isomalt, Palm and Palm Kernel Oil, Cocoa Powder, Soy Lecithin, Polyglycerol Polyricinoleate, Sucralose), Hydrolysed Collagen, Fructo-Oligosaccharides, Chocolate Caramel Flavouring Prep. (10%) (Glycerin, Maltodextrin, Oligofructose, Water, Maltitol, Coconut Oil, Starch, Skimmed MilkPowder, Cocoa Powder, Pectin, Calcium Lactate, Soy Lecithin, Flavouring, Salt, Xanthan Gum, Caramel Colour), Humectant: Glycerin, Soy Protein Crisp Prep. (Soy Protein Isolate, Starch, Calcium Carbonate, Salt), Bulking Agent: Polydextrose, Water, Soy Protein Isolate, Sunflower Oil, Inulin, Cocoa Powder, Salt, Ascorbic Acid, Vitamin B6 Prep. (Maltodextrin, Pyridoxine Hydrochloride), Magnesium Oxide, Peppermint Flavouring (0.11%) Prep. (Acacia Gum, Natural Peppermint Flavouring), Nicotinamide, Antioxidant: Natural Mixed Tocopherols, Sweetener: Sucralose, Vitamin B12 Prep. (Maltodextrin, Cyanocobalamin), Thiamin Hydrochloride. 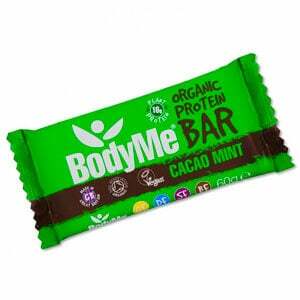 How amazing would it be if you could get most of your daily nutrients in just one bar? Well newsflash! 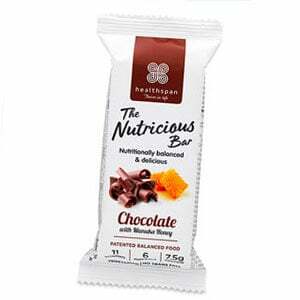 Now you can with the Nutricious Bar! 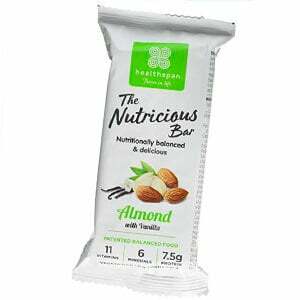 The Nutricious Bar is the world's first snack bar to provide 15% of your daily nutrition requirements in just one bar! Also, may contain egg, milk products, nuts, peanuts and sesame seeds. Milk Protein Prep. 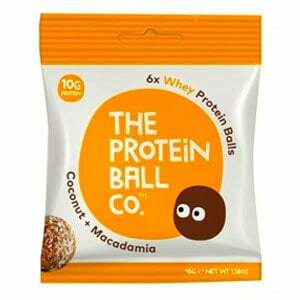 (Milk Protein, Whey Protein Concentrate [Milk], Soy Lecithin), Dark Chocolate Flavoured Coating Prep. (14%) (Isomalt, Palm and Palm Kernel Oil, Cocoa Powder, Soy Lecithin, Polyglycerol Polyricinoleate, Sucralose), Hydrolysed Collagen, Fructo-Oligosaccharides, Chocolate Caramel Flavouring Prep. (10%) (Glycerin, Maltodextrin, Oligofructose, Water, Maltitol, Coconut Oil, Starch, Skimmed Milk Powder, Cocoa Powder, Pectin, Calcium Lactate, Soy Lecithin, Flavouring, Salt, Xanthan Gum, Caramel Colour), Humectant: Glycerin, Soy Protein Crisp Prep. (Soy Protein Isolate, Starch, Calcium Carbonate, Salt), Bulking Agent: Polydextrose, Water, Soy Protein Isolate, Sunflower Oil, Inulin, Cocoa Powder, Salt, Ascorbic Acid, Vitamin B6 Prep. (Maltodextrin, Pyridoxine Hydrochloride), Magnesium Oxide, Peppermint Flavouring (0.11%) Prep. (Acacia Gum, Natural Peppermint Flavouring), Nicotinamide, Antioxidant: Natural Mixed Tocopherols, Sweetener: Sucralose, Vitamin B12 Prep. (Maltodextrin, Cyanocobalamin), Thiamin Hydrochloride. Rolled Oats, Fructose, Rice Crisps (Rice Flour, Rice Bran), Roasted Almonds (Almonds[6%], Sunflower Oil), Rice Syrup Solids, Humectant: Glycerin, Brown Rice Syrup, SoyNuggets (Soy Protein Isolate, Rice Flour, Malted Barley Syrup, Salt), Rice Bran Oil, Thickener: Acacia Gum, Pumpkin Seeds, Manuka Honey, Coconut Oil, Chia Seeds, Emulsifier: Soy Lecithin, Vitamin & Mineral Prep. (Dicalcium Phosphate, Maltodextrin, Magnesium Oxide, Ascorbic Acid, DL Alpha Tocopherol Acetate, Nicotinamide, Zinc Sulphate, Calcium Pantothenate, Retinyl Acetate, Ferrous Sulphate, Cyanocobalamin, Cholecalciferol, Pyridoxine Hydrochloride, Thiamin Hydrochloride, Riboflavin, Folic Acid, Potassium Iodide), Natural Vanilla Flavouring (0.3%). May also contain traces of soya, peanuts, other nuts and the odd shell or pit piece. Who said getting 1 of your 5 a day had to be boring? 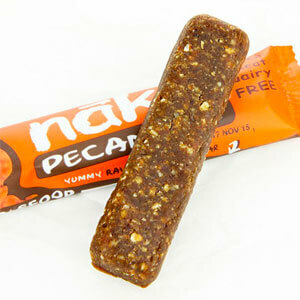 Each tasty pecan bar contains 12g carbs and 1.1g sat fat which help keep your fuelled throughout the day. Only 100% natural ingredients go into each bar with no added sugars, chemicals or artificial flavours. Milk protein, milk chocolate (sweetener (maltitol), cocoa butter, milk powder, cocoa mass, emulsifier (soy lecithin), flavouring), humectant (glycerine), isomalto-oligosaccharide, collagen hydrolysate, water, peanuts, white chocolate (sweetener (maltitol), cocoa butter, milk powder, emulsifier (soy lecithin), flavouring), soy nuggets (soy protein isolate, cocoa, tapioca starch), palm fat, peanut paste, cocoa powder, flavouring, salt, sweetener (sucralose, acesulfame potassium). Milk protein, milk chocolate (18.5%), (sweetener (maltitol), cocoa butter, whole milk powder, cocoa mass, emulsifier (soy lecithin), flavouring), humectant (glycerine), isomalto-oligosaccharide, collagen hydrolysate, water, cashew nuts (5.5%), white chocolate (4.5%), (sweetener (maltitol), cocoa butter, milk powder, emulsifier (soy lecithin), natural flavouring, palm fat, peanut paste, fat reduced cocoa powder, flavouring), sweeteners (sucralose, acesulfame k). 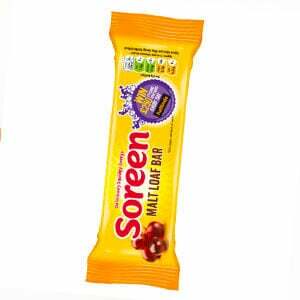 From the people who bought you the original malt loaf, welcome the deliciously squidgy energy Malt Loaf Bar. 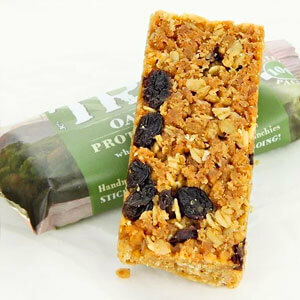 A deliciously squidgy loaf bar with juicy raisins to help keep you fuelled up and ready for action. 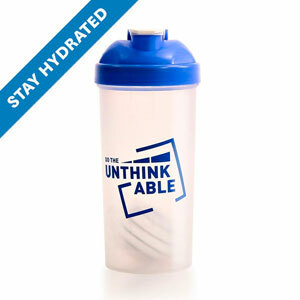 Take them with you wherever you go; they'll be ready for anything! 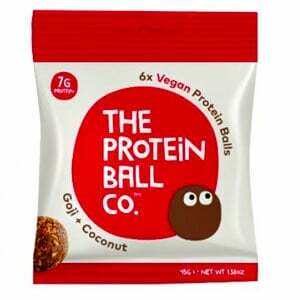 Gluten free, all natural, vegan AND with NO added sugars, these gorgeous little balls are a truly wonderful little snack indeed! These fab paleo friendly balls are crammed with the natural goodness of goji berries – rich in antioxidants, vitamins & coconut – perfect for a quick energy boost. 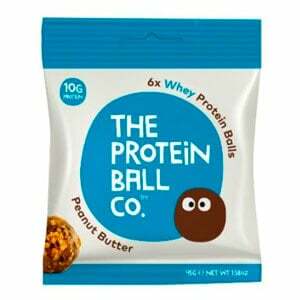 These peanut butter protein balls are a positive taste proclamation having been made from just 7 natural ingredients including peanuts, peanut butter and sweet dates. PLUS, they’re soy free, all natural, vegetarian friendly AND delicious! These fab little Paleo friendly protein balls are just what you need to keep your cravings under control, and considering they’re soy free, suitable for vegetarians, AND with ZERO added sugar – you’ll struggle to find a cleaner, healthier and more delicious snack! 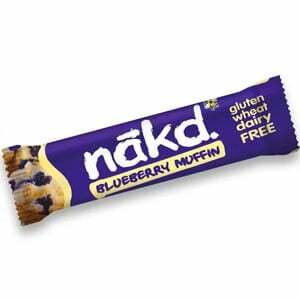 The new Nakd Blueberry Muffin snack bar is bursting with scrumptious flavours. Just fruit and nuts smooshed together, this blueberry beauty is made from 100% natural ingredients, vegan-friendly, gluten free and a 100% natural super tasty snack. All of that and it counts as one of your five a day! Loco for Cocoa? 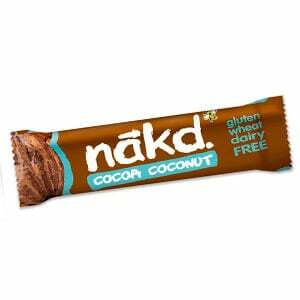 Nakd Cocoa Delight snack bars are a scrummy combination of rich cocoa, fruit and nuts – no added sugars or syrups, just chocolatey satisfaction. This whole-food wonder is made from 100% natural ingredients smooshed together with no added sugar or sticky syrups, gluten free, dairy free and vegan friendly. Plant protein blend (pea protein, brown rice protein, hemp protein), cashews, dates, coconut nectar, cacao (5%), cacao nibs (4%), coconut oil, water, orange oil (0.3%), sea salt. Packed at locations where gluten, tree nuts and other nuts are handled. 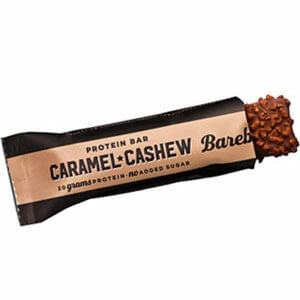 It's time to wrap your chops around the first clean, vegan, HIGH protein bar to grace Muscle Food! 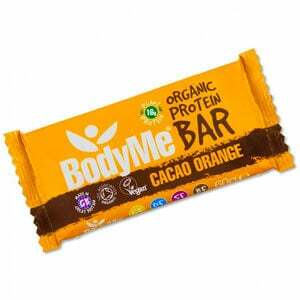 Introducing the Body Me Cacao Orange Bar, an avant-garde bar brimming with choccyness and delicious orange zing. Plant protein blend (pea protein, brown rice protein, hemp protein), cashews, dates, coconut nectar, chia seeds (5%), cacao, coconut oil, vanilla extract (2%), water, sea salt. 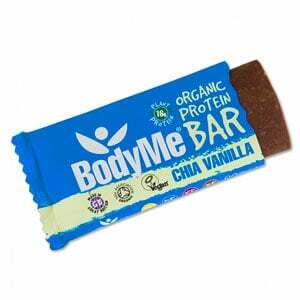 Join the protein bar revolution folks with this stunning Chai Vanilla Protein bar by Body Me. Ethically sourced and produced right here in the UK, this stunning bar is made from nothing but 100% organic, vegan friendly ingredients including raw fruit, nuts, superfoods and oils. Even the careful blend of plant proteins - pea, hemp and rice is organic giving you a down to earth, natural +16g protein hit in every bar. Plant protein blend (pea protein, brown rice protein, hemp protein), cashews, dates, coconut nectar, cacao (5%), cacao nibs (4%), coconut oil, water, peppermint oil (0.12%), sea salt. 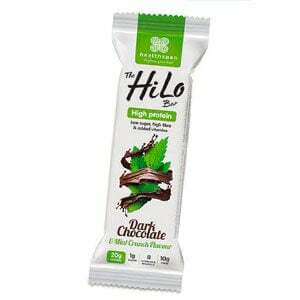 Deliciously chocolatey and bursting with minty freshness, it is hard to believe that THIS incredible bar is 100% vegan and packing +16g protein! Made in the UK using ethically sourced, organic raw fruit, superfoods, nuts and oils, this innovatory bar is the first of its kind to grace Muscle Food. Eating healthily means no snacking - right? WRONG! 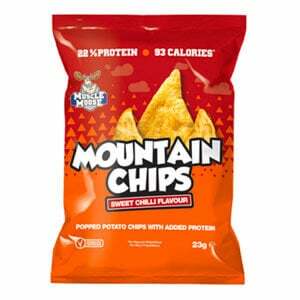 Because with these Sweet Chilli Mountain Chips from Muscle Moose you can snack yourself happy WITHOUT the guilt! Eating healthily means no snacking - right? WRONG! Because with these BBQ Mountain Chips from Muscle Moose you can snack yourself happy WITHOUT the guilt! Developed to complement your clean and lean diet, these tasty tortilla chips are your new snacking staple! 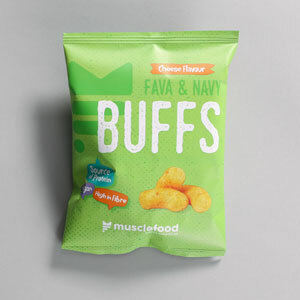 Cheese (Pasteurised Cows’ Milk, Anti Caking Agent: Potato Starch), Savoury Mix (Salted Edamame Beans (Edamame beans (Soy), Palm Oil, Salt), BBQ Flavoured Rice Cracker (Rice, Palm Oil, Sugar, BBQ Seasoning (Sugar, Salt, Yeast Extract, Maltodextrin, Vinegar Powder, Tomato Powder, Onion Powder, Malt Extract (Barley), Garlic Powder, Dextrose, Anti Caking Agent: Calcium Phosphate, Silicon Dioxide; Acidity Regulator: Malic Acid, Smoked Flavouring, Pepper Powder), Tapioca Starch, Soy Sauce (Water, Soy, Wheat, Salt), Roasted Spicy Corn (Corn, Vegetable Oils (Sunflower, Paprika), Salt, Chilli Seasoning (Maltodextrin, Herbs and Spices, Dried Tomato, Salt). 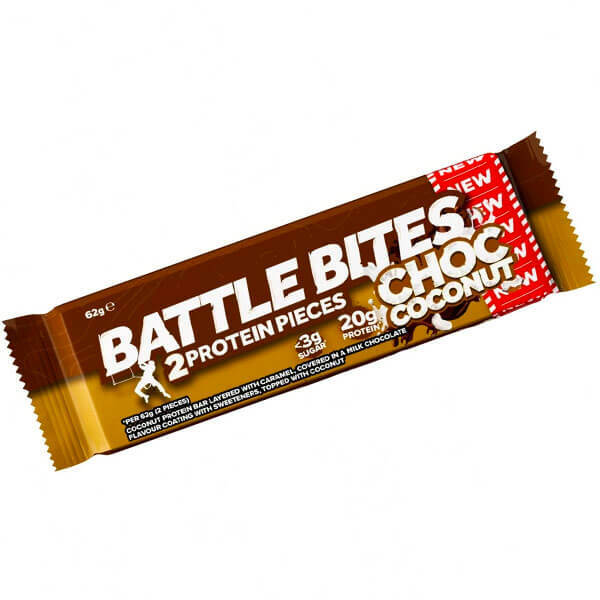 Up your snacking game with these fab.u.LOUS packs of protein packed tastiness. Each pack contains a scrumptious mix of beans, BBQ rice puffs and cheese to help keep you full and satisfied throughout the day. PLUS, you'll receive a wonderful hit of protein with each pack delivering +10g of your favourite muscle building macro whilst also being LOW in sugar. 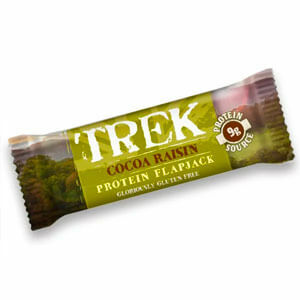 Perfect post workout, or as a sneaky nibble at your desk to help see you through the 3pm slump. Cheese (Pasteurised Cows’ Milk, Anti Caking Agent: Potato Starch), Savoury Mix (Black Soy Beans (Black Soy Beans, Salt), Sweet Chilli Flavoured Rice Cracker (Rice, Rice Oil, Soy Sauce (Water, Soy, Wheat, Salt), Sugar, Thai Sweet Chilli Seasoning (Sugar, Chilli Powder, Onion Powder, Yeast Extract, Rice Flour, Garlic Powder, Sunflower Oil, Anti Caking Agent: Silicon Dioxide; Flavouring: Paprika Extract, Sunflower Oil, Antioxidant: Rosemary Extract, Spice Extract (Capsicum Extract, Emulsifier: Mono and Diglycerides of Fatty Acid, Sunflower Oil), Salt, Yeast Extract, Colour: Paprika Extract), Chilli Lime Coated Green Peas (Green Peas, Sugar, Wheat Flour, Rice Flour, Modified Starch, Corn Starch, Lime Chilli Powder (Chilli, Lime Powder, Dextrose, Maltodextrin, Acidity Regulator: Citric Acid, Paprika Powder, Pepper, Garlic Powder), Salt, Soy Sauce (Soybean, Wheat, Salt, Water), Palm Oil). Up your snacking game with these fab.u.LOUS packs of protein packed tastiness. 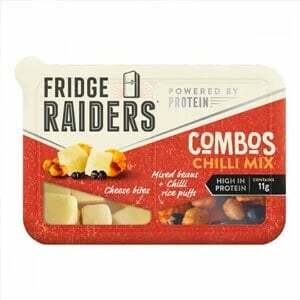 Each pack contains a scrumptious mix of Beans, Sweet Chilli Rice Crackers & cheese. PLUS, you'll receive a wonderful hit of protein with each pack delivering +10g of your favourite muscle building macro, whilst also being LOW in Sugar. You won't even find any added colouring's or artificial flavours. An usher in a new era of snacking delight - YUM! Perfect for your gym bag as a post-workout snack, and packed full of delicious oven roasted hazelnuts & pistachio nuts, goji berries and raisins. 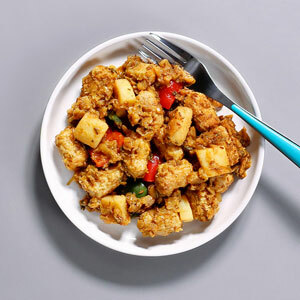 Soy Pieces (29%) [Water, Isolated Soy Protein, Wheat Gluten, Wheat Starch, Soy Protein Concentrate, Natural Flavouring, Shio Koji: Rice, Water, Salt, Ethyl Alcohol, Bamboo Fibre Cellulose], Cooked Rice (25%), Jeera Sauce (32%) [Onion, Water, Rapeseed Oil, Green Chilli, Garlic Puree, Ground Cumin (0.5%), Lemon Juice, Cumin Seeds (0.2%), Ginger Puree, Coriander Leaves, Garam Masala (Coriander, Black Pepper, Ginger, Cumin, Cassia, Dill, Fennel Cloves) Salt, Ground Coriander], Roasted Potato, Peppers. Cooked Rice (31%), Cajun Sauce (25%)[Water, Passata (Tomatoes), Onion, Mushrooms, Cajun Spice (Salt, Paprika, Garlic Powder, Onion Powder, Black Pepper, Cayenne Pepper, Thyme, Oregano), Worcestershire Sauce (Water, Spirit Vinegar, Cane Molasses, Tamarind Paste, Salt, Onion Powder, Garlic Powder, Clove Powder), Tabasco (Distilled Vinegar, Red Pepper, Salt)], Cooked Minced Beef (25%) [Beef Mince (98%), Garlic Powder, Basil, Ground Black Pepper, Salt], Mixed Peppers, Spring Onion, Carrots. 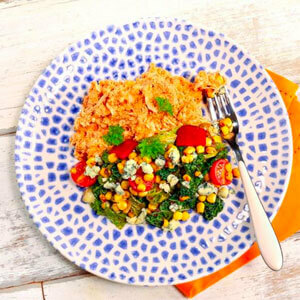 The future of convenient meals is here with our Cajun Rice Pot and you need to try them - simple, quick and delicious! 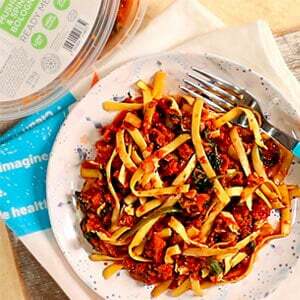 This Vegan Ragu with Tagliatelle Meal Pot is the perfect go-to nutritional meal that's ready in minutes. It brings together mushrooms and spinach in a rich tomato ragu sauce and the unique ribbon texture of tagliatelle pasta in one delicious pot - suitable for vegans of course. 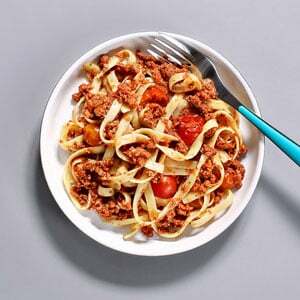 Rich, flavourful and deliciously meaty, this Beef Ragu Tagliatelle Meal Pot is ready in minutes - perfect if you need a quick, yet nutritious meal. 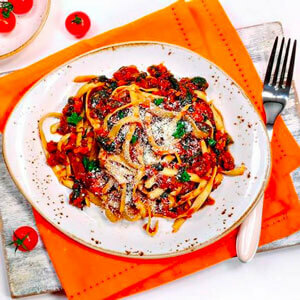 Combining minced beef with a beautiful tomato sauce, cherry tomatoes, chopped mushrooms and the unique ribbon texture of tagliatelle pasta that soaks up the sauce, this will surely make your taste buds go wild! This Buffalo Chicken with Blues and Greens is a delicious meal, developed and hand prepared by our expert in-house chef. Part of our Live Clean collection, this beautiful Buffalo Chicken combines with Stilton cheese, green vegetables and tomatoes for a rich, creamy taste and is the latest dish to join our Slim Meals range. Sauce (68%) [Mushrooms (16%), Water, Chopped Tomatoes, Passata (Tomatoes, Acidity Regulator: Citric Acid), Onion, Carrots, Tomato Purée, Garlic, Vegetable Stock (Concentrated Juice of Vegetables (Carrot, Celery, Leek, Onion), Water, Yeast Extract, Salt, Cornflour), Olive Oil, Cornflour, Paprika, Oregano, Black Pepper, Bay Leaf], Cooked Pasta (Durum Wheat Semolina, Water), Baby Spinach (8%). Ndjua Pork Sauce (62%) [Tomatoes (Tomatoes, Tomato Juice), Nduja Pork Crumb (Pork,Pork Fat, Red Pepper Flakes, Chilli Powder, Paprika, Chilli Flakes, Salt, Cayenne Pepper), Passata (Tomatoes, Citric Acid), Onions, Salt.] Cooked Pasta (36%) (Water, Durum Wheat Semolina), Parmesan Cheese (Milk), Parsley (1%). 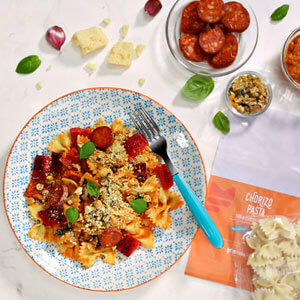 This Nduja Pork Pasta Kit makes cooking a delicious meal simple and quick. Combine spicy Nduja pork, delicious sauce, penne pasta and a parsley crumb to whip up a tasty, nutritious meal for one in minutes. 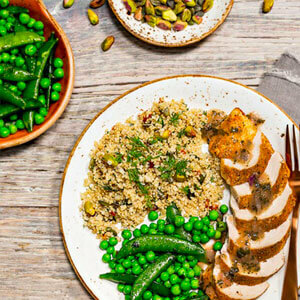 From pack to pan, this clean and tasty kit is perfect as an easy midweek meal or a hearty post workout feast. Cooked Pasta (39%) (Water, Durum Wheat Semolina), Brown Mushrooms (25%), White Mushrooms (22%), Pesto (12%) (Basil (26%), Regato Cheese (98%) (COW'S MILK, Salt, Microbial Rennet, Starter Culture, Potato Starch 2%), Water, Lemon Juice, Rapeseed Oil, Garlic, Salt, Cornflour.) Walnuts, Chilli Flakes. This Mushroom Pesto Pasta Kit takes the hassle and fuss out of healthy cooking. 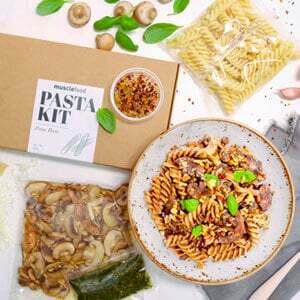 Perfectly portioned for one, each kit contains fusilli pasta, mixed mushrooms, a delicious basil pesto and walnut chilli crumb. So you can whip up a mouth-watering feast in a matter of minutes, with no waste after you've finished. The future of lunch is here. 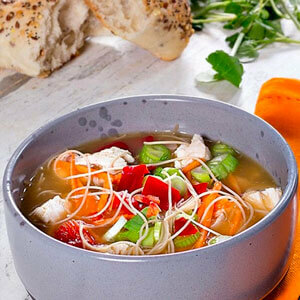 And it comes in a pot... our cracking Chicken Chow Mein Noodle Pot – a fuss free meal for one in a pot that won’t ruin your clean and lean diet! Cooked Chicken (28%), Cooked Rice (28%), Balti Sauce (26%) Passata (Tomatoes, Acidity Regulator: Citric Acid), Ginger, Garlic, Curry Powder (Coriander, Turmeric, Cumin Powder, Salt, Rice Flour, Fenugreek, Mustard Powder, White Pepper, Chilli Powder, Ginger, Fennel, Paprika, Mace), Honey, Garam Masala (Coriander, Black Pepper, Ginger, Cumin, Cassia, Dill, Fennel Cloves), Salt, Lemon Juice, Coriander Leaves], Red Peppers, Red Onion. This stunning pot of deliciousness contains oodles of chicken, cooked rice and a bangin’ Balti sauce certain to set your taste buds alight. Tangy, sweet and spicy at the same time. 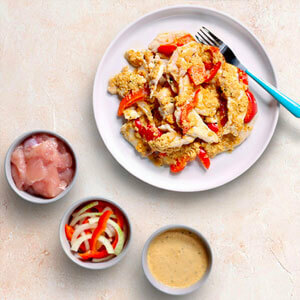 Introducing the sumptuously creamy taste of satay chicken – macro-friendly and convenient to cook in JUST 6 minutes. Cooked Chicken (33%), Cooked Rice (32%), Black Bean Chilli Sauce (19%) (Water, Black Beans (2.5%), Garlic, Honey, Soy Sauce [Water, Salt, Soybeans (12%), Wheat Flour], Onion, Corn Flour, Cider Vinegar, Ginger, Red Chilli (0.5%)), Cauliflower (6%), Carrots (5%), Broccoli (5%). Delicious black bean chicken combines with rice in this convenient Black Bean & Chicken Rice Pot. Cooked Chicken (33%), Cooked Rice (32%), BBQ Sauce (19%) Passata (Tomatoes, Acidity Regulator: Citric Acid), Agave, Paleo Worcester Sauce (Tamarind, Water, Balsamic Vinegar, Maple Syrup, Cider Vinegar, Vinegar, Anchovies (Fish), Onion Powder, Garlic Powder, Ground Cloves, Tabasco), Cider Vinegar, Soy Sauce (Water, Salt, Soybeans, Wheat Flour), Paprika, Smoked Paprika, Onion Powder, Garlic Powder, Salt, Mustard Powder, Ground Ginger], Cauliflower (6%), Carrots (5%), Broccoli (5%). Cooked Chicken (33%), Cooked Rice (32%), Thai Green Sauce (19%) [Coconut Milk, Water, Onion, Ginger, Lime Juice, Garlic, Green Thai Paste (2%) (Green Chilli (31%), Lemongrass, Garlic, Salt, Galangal, Shrimp Paste (Crustaceans), Salt), Kaffir Lime Peel, Coriander Seed, Pepper, Cumin, Turmeric), Coriander Leaves, Basil, Agave, Lemon Grass, Salt, Ground Coriander, Guar Gum, Ground Cumin], Green Beans (9%), Red Peppers (6%). You see we took the classic Thai Green Curry and gave it a spruce up to make it healthier and more in tune with your gym needs... And not only that, IT TASTES AMAZING! Packed in an environment that handles Gluten, Crustaceans, Eggs, Fish, Peanuts, Soya, Milk, Nuts, Celery, Mustard, Sesame and Sulphites. May contain the occasional stones/pits from fruit. Don’t think you would find a pot of gold at the end of the rainbow? Think again… Introducing the Sweet Chilli Chicken Pot O Gold – packing a protein punch with irresistible taste. Cooked Chicken (33%), Cooked Rice (32%), Tikka Sauce (19%) [Passata (Tomatoes), Coconut Milk (Coconut Extract, Water), Cream (Milk), Tomato Purée, Agave, Red Chilli, Curry Powder (Coriander, Turmeric, Cumin Powder, Salt, Rice Flour, Fenugreek, Mustard Powder, White Pepper, Chilli Powder, Ginger, Fennel, Paprika, Mace), Coriander Leaves, Ginger, Garlic, Garam Masala (Coriander, Black Pepper, Ginger, Cumin, Cassia, Dill, Fennel, Cloves), Paprika, Ground Cumin, Ground Coriander], Cauliflower (6%), Broccoli (6%), Carrots (4%). 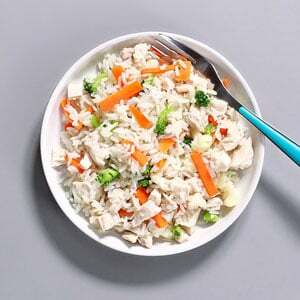 High in protein, brimming with low GI carbs and deliciously low in sat fats, this Chicken & Rice pot is the perfect post workout meal on the go. Each element of the dish is provided in a separate tray with different cooking times. After-all if you were cooking chicken and veg you wouldn't cook them for the same time would you? Cooked to perfection. 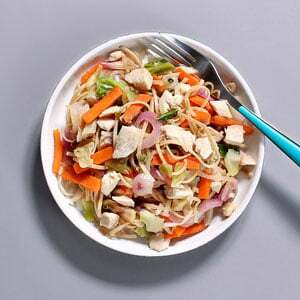 Oriental Spiced Chicken and Whole-Wheat Noodles in a Spicy Peanut Sauce with Crunchy Asian Vegetables hand-made for you by our Michelin star trained chef. 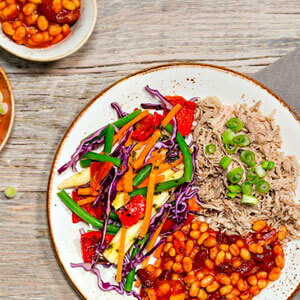 Mouth-watering Pulled Pork with the perfectly spiced smokiness of Chipotle Beans and Peppers, alongside a buttered medley of Rainbow Vegetables, hand-made for you by our Michelin star trained chef. Lemon Chilli Chicken (52%) [Chicken (66%), Red Peppers, Lemon Juice (8%), Lemon Slice (2%), Red Chilli (2%), Garlic, Lemon Peel (0.7%), Salt, Guar Gum, Cracked Black Pepper], Pamentier Potatoes (48%) [Potatoes (Potatoes, Sunflower Oil, Dextrose) (72%), Green Beans (25%), Garlic, Rosemary (0.9%), Salt, Cracked Black Pepper]. Mouth-watering Roasted chicken in a lemon and chilli sauce with parmentier potatoes, rosemary and green beans handmade for you by our Michelin Star Trained Chef! 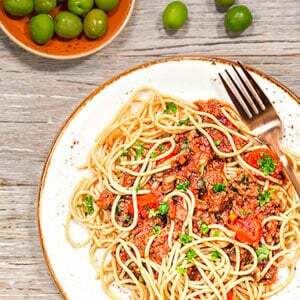 Beef Ragu (62%) (Passata [Tomatoes, Salt, Acidity Regulator (Citric Acid)], Minced Beef (24%) [Beef Mince (98%), Garlic Powder, Basil, Ground Black Pepper, Salt], Cherry Tomatoes (15%), Tomato Puree, Mushrooms, Onion, Carrots, Worcestershire Sauce [Malt Vinegar (from Barley), Spirit Vinegar, Molasses, Salt, Anchovies (Fish), Tamarind Extract, Onions, Garlic, Spice, Flavourings], Basil), Spaghetti (38%) (Whole Wheat Durum Semolina). Chicken (47%), Curry Powder (Coriander, Turmeric, Cumin Powder, Salt, Rice Flour, Fenugreek, (Mustard Powder, White Pepper, Chilli Powder, Ginger, Fennel, Paprika, Mace. ), Chinese 5 Spice (Star Anise, Cinnamon, Fennel, Black Pepper, Clove), Chinese Curry Sauce (Coconut Milk (19%), Soy Sauce [Water, Salt, Soybeans (12%), (Wheat Flour], Garlic, Ginger, Gums), Peas (20%), Onion (7%). How would you like to treat yourself to a Chinese style curry with NO guilt? Now you can with our fab Chinese Style Chicken Curry - whoop! Perfectly portioned for one, this stunning curry has been developed especially for you by our Michelin Star Trained Chef. 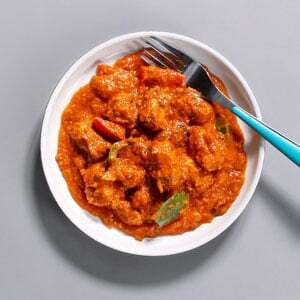 An authentic tasting Chicken Tikka Curry with no mess or fuss? You'd better believe it! Inside each tasty pack you'll find stunning strips of wholesome chicken breast fillet and an array of chunky, micronutrient rich veg, including crunchy peppers, perfectly portioned for one. You'll also find our incredible Tikka sauce - developed exclusively for Muscle Food by our resident Michelin Star trained chef. No dicing, no slicing, no waiting around for hours for your Tikka sauce, simply pour the three pouches into a pan and cook! Curry cravings driving you crazy? We have you covered with our EXCLUSIVE Chicken Balti Curry! Developed especially for you by our Michelin Star Trained chef, this curry pack will provide you with everything you need to make a stunning, spicy and authentic style Balti curry from the comfort of your own kitchen. Thai Spiced Chicken with Green Beans, Mixed Peppers and Onions ready to cook straight from bag to pan. Convenience 1. Waste ZERO! 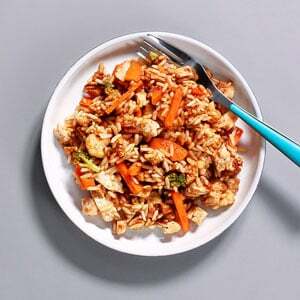 We've transformed the face of healthy eating with this perfectly portioned Thai Chicken Easy Cook Stir-fry for one as it contains everything you need for a healthy, hearty meal. 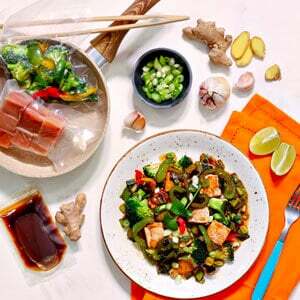 From sumptuous salmon, to fresh veg and oodles of tantalising teriyaki sauce, all you have to do is open the bag and pour into a hot pan for an effortless meal in no time. So much better than buying everything individually only to have mountains of fresh produce leftover, don't you think? 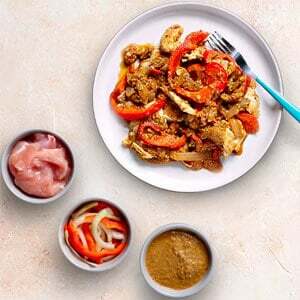 No waste, no prep, no mess, no fuss - just clean, lean and delicious grub ready in minutes all thanks to our GORGEOUS 5 Spice Pork Easy Cook Stir-fry! 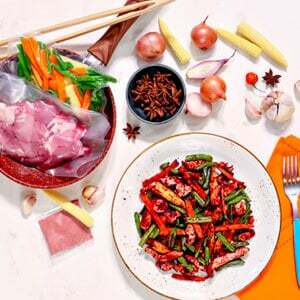 Perfectly portioned to serve one, each bag contains everything you need to create a hearty and tasty dish, including pork, mixed peppers and red onion. 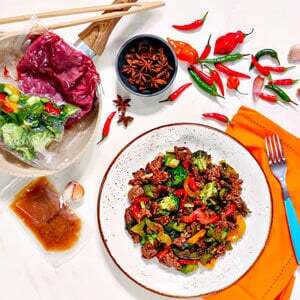 Tender beef, juicy mushrooms, mixed peppers and red onion all dished up with a stunning Oriental stir-fry sauce? It can only mean one thing, a NEW Easy Cook Stir Fry! 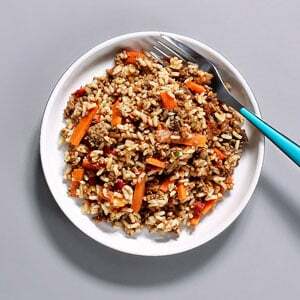 Each beef packed kit is perfectly portioned to serve one, and contains everything you need to create a delicious, clean mid-week meal in mere minutes. Chicken (43%), Peppers (40%), Red Onion (17%). 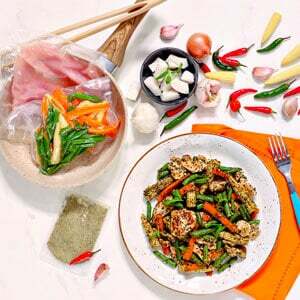 You already love our incredible Easy Cook Stir-Fry range, but this one is just a little different as you can decide on how you'd like to season it. 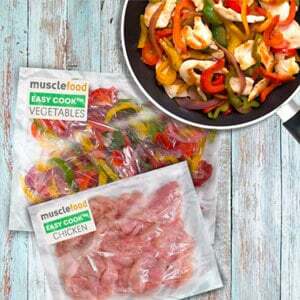 Yep, we've taken the fuss and mess of prep out of your life by freshly dicing our class A Chicken Breast Fillets along with an array of fresh veg (mixed peppers, red onion) and popping it all in a perfectly portioned for one bag. 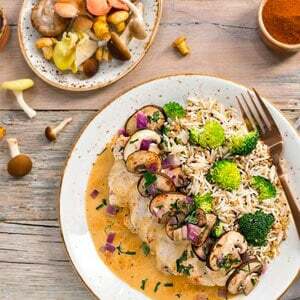 Chicken and Mushrooms in a cream sauce with wild rice, leeks and broccoli, freshly prepared for you by our Michelin Star Trained Chef. Clean, wholesome ingredients, nothing artificial and lab tested nutritionals - healthy eating made simple. Part of the Live Clean High Protein Balanced Meals range always nutritionally balanced with a maximum of 600 calories and at least 30% protein per meal. Chicken (42%), Korma Sauce (42%) [Water, Onions, Reduced Fat Coconut Milk (6%)(Coconut Cream, Water), Cream (3%) (Milk), Garlic, Ginger, Almonds (2%), Tomato puree, Honey, Ground Cumin, Coriander leaves, Ground Coriander, Salt, Garam masala [Coriander, Black Pepper, Ginger, Cumin, Cassia, Dill, Fennel & Cloves], Cardamom, Turmeric, Cloves, Dried Bay leaf, Dried Cinnamon, Cayenne Pepper.] Peppers, Onions. Fancy a Chicken Korma but don't have the time to make it all from scratch? Well, this Chicken Korma Curry Kit makes it quick and simple. You receive everything in the pack to rustle up a tasty Korma, with succulent chicken breast, a bag of vegetables and a creamy coconut almond sauce. 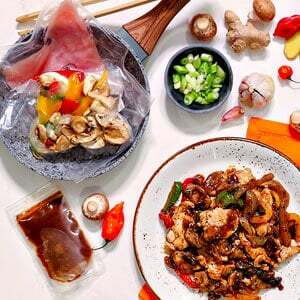 Chicken Breast (37%), Mushrooms(20%), Mixed Peppers (20%), Black Bean Chilli Sauce (14%)(Water, Black Beans (1.5%), Garlic, Honey, Light Soya Sauce (Water, Salt, Soya beans, Wheat Flour), Onion, Cider Vinegar, Corn Flour, Ginger, Red Chilli), Onion. Up your dinner game with this incredible Black Bean and Chicken Stir-Fry kit EXCLUSIVE to yours truly, and unbelievably delish. 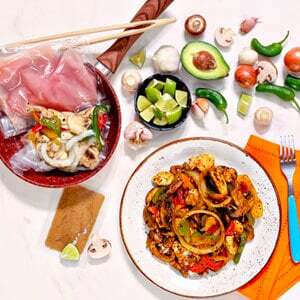 Each kit bag contains everything you need in the comfort of your own home, including strips of lean Chicken Breast Fillet, veggies and a beautiful black bean sauce. Also, may contain Wheat and Soya. Marinated roast chicken breast on a convenient 'ready to eat' skewer? Yes please! 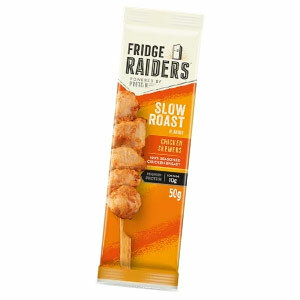 Fridge Raiders have taken some succulent roast flavoured chicken bites made with 100% seasoned chicken with a unique blend of natural herbs and spices, then cooked to perfection. These Chicken and Basil Meatballs are a great on-the-go snack or meal accompaniment. Each one is made from tender chicken combined with tomato and herbs for a beautifully Italian inspired taste, which pack nutritional benefits too! 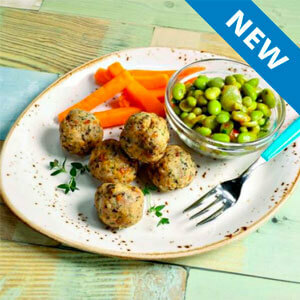 High in protein, these meatballs are a good post-workout snack or go great as part a main meal. Chicken Breast (99%), Salt, Dextrose, Sugar, Maize Starch, Tomato Powder, Emulsifier (Sodium Triphosphate), Garlic Powder, Paprika, Yeast Extract, Onion Powder, Black Pepper, Paprika Extract, Smoke Flavouring (Smoke Flavouring, Maltodextrin), Sunflower Oil, Natural Flavouring. Smokey BBQ marinated chicken breast in a convenient 'ready to eat' pack? Yes please! 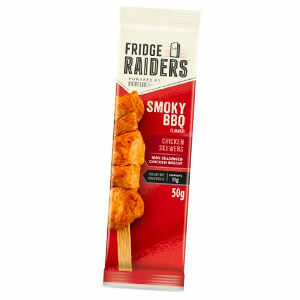 Fridge Raiders have taken some juicy chicken breasts and marinated them in a delicious BBQ flavouring before skewering and cooking to perfection. 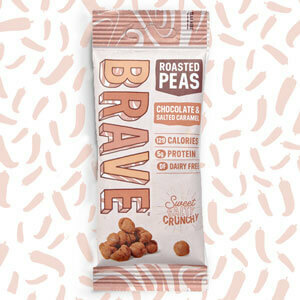 Introducing Our Peas de Résistance: the world's first chocolate roasted peas! 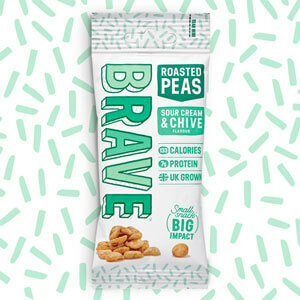 Brave have dipped deliciously crunchy roasted peas in a rich single-origin dark chocolate with a twist of salted caramel, creating an incredibly moreish snack that’s sweet, savoury and crunchy! Packed with 5g of protein per pack and 50% less sugar than alternatives like chocolate covered nuts, they're a delicious indulgence you can actually indulge in! We’ve recreated a classic flavour using all-natural spirit and malt vinegar from Staffordshire. Each pack is an ideal snack any time of day helping you source your daily needs of protein and fibre. 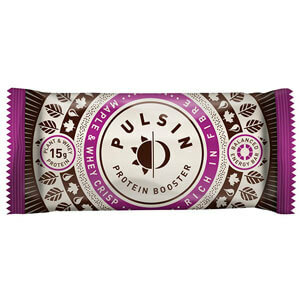 One serving contains 6g+ of protein and is vegan friendly, with a clean taste and crunchy texture. These split dried yellow peas perfectly seasoned to give you a tasty snack that won't have you worrying about your macros. A classic flavour. Clean, simple and delicious. The best of British-grown peas tossed with a bit of sea salt. Each pack is an ideal snack any time of day helping you source your daily needs of protein and fibre. One serving contains 6g+ of protein and is vegan friendly, with a clean taste and crunchy texture. These split dried yellow peas perfectly seasoned to give you a tasty snack that won't have you worrying about your macros. 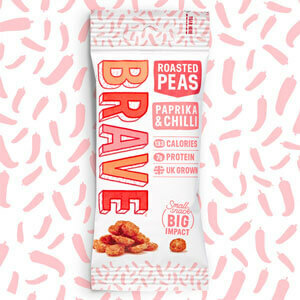 A fiery combo of Paprika & Chilli brings the heat to the best of British-grown pea. Each pack is an ideal snack any time of day helping you source your daily needs of protein and fibre. 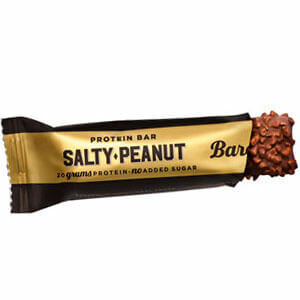 One serving contains 6g+ of protein and is vegan friendly, with a clean taste and crunchy texture. These split dried yellow peas perfectly seasoned to give you a tasty snack that won't have you worrying about your macros. More crunch and flavour than you can savour. A bit of chive adds a beautiful balance to the zesty vegan sour cream. Tumbled with the best of British-grown peas. 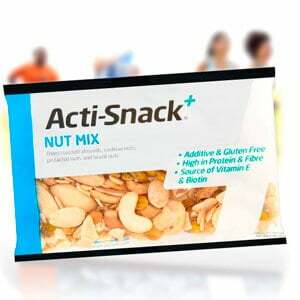 Each pack is an ideal snack any time of day helping you source your daily needs of protein and fibre. 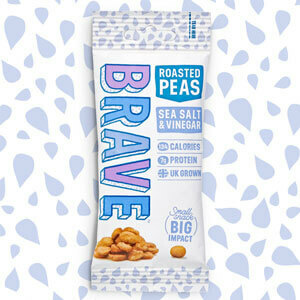 One serving contains 6g+ of protein and is vegan friendly, with a clean taste and crunchy texture. These split dried yellow peas perfectly seasoned to give you a tasty snack that won't have you worrying about your macros. 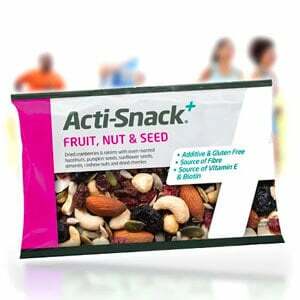 Active, on-the-go & looking to ‘snack happy’? We’ve got your back! 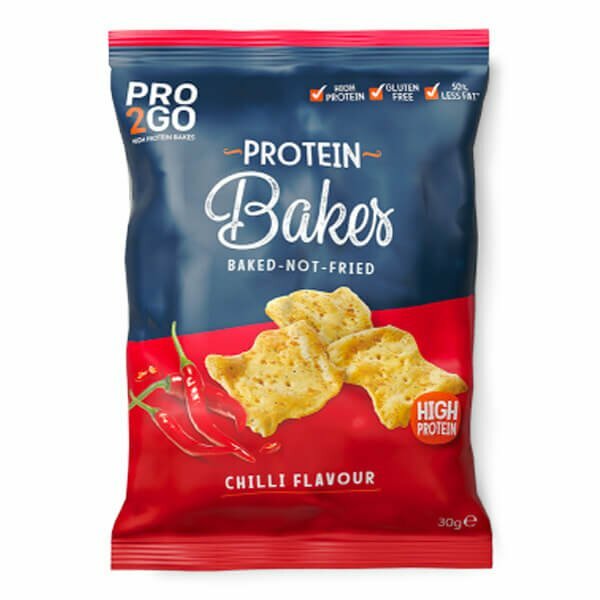 It’s not always about going for a sweet treat, especially when you’ve got a savoury craving, so why not make sure you’ve always got a bag of our high protein bakes in your bag. 30g of greatness, Sci-MX packed serious taste into every crunch. 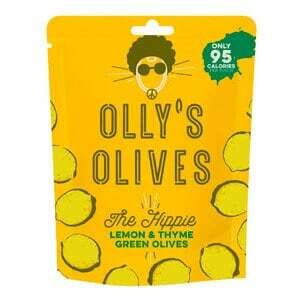 High in protein, gluten free, vegan friendly and with 50% Less Fat than Regular Crisps! 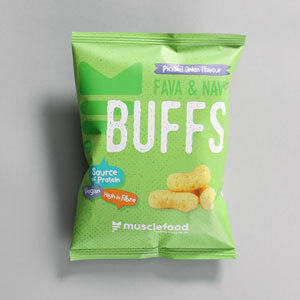 Change up your snack time with these Bean Puffs from musclefood, delicious and less than 90 calories per pack! Made from bean and rice flour then baked to light and airy perfection, they're crunchy and flavourful, perfect for keeping hunger pangs at bay until lunchtime! 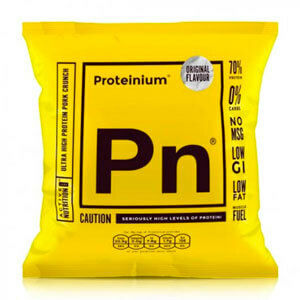 Proteinium is an all natural, high concentrate Pork based protein food that can be eaten as a supplement or snack at any time as it contains zero carbohydrates and is low in fat compared to other snack foods. Protein blend (soy protein isolate, pea protein isolate, sodium caseinate); potato flour; sunflower oil; soy flour; potato starch; salt; dehydrated vegetables (onion, tomato, garlic); yeast extract; torula yeast; sodium diacetate; calcium carbonate; flavour; hydrolyzed wheat and soy protein; spices; acidity regulator: citric acid; anti-caking agent: silicon dioxide. Love Nik Naks or Twiglets? You will love these! 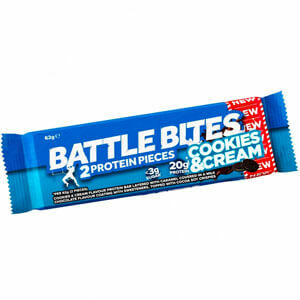 Seriously tasty flavour and an impressive 15g of protein in each rather large 38g pack! 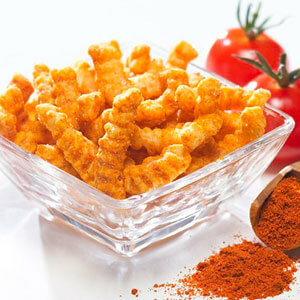 Not only a great high protein snack, these Smoky Barbecue flavoured crunchy snacks contain only 0.4g of saturated fat. Beef (150g of Raw Meat per 100g of Finished Product) Seasoning (Sugar, Flavouring (), Maltodextrin, Sunflower Oil, Flavour Enhancer (Monosodium Glutamate), Spices, Garlic Powder, Onion Powder), Salt, Acidity Regulator (Trisodium Citrate), Antioxidant (Sodium Erythorbate), Preservative (Sodium Nitrite). Extra lean and high in protein, Beef Jerky is one of the healthiest snacks on the market! 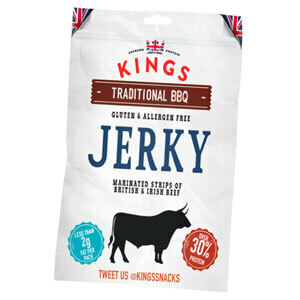 And Kings have just upped the game with a traditional BBQ flavoured Jerky that’s completely Gluten FREE. 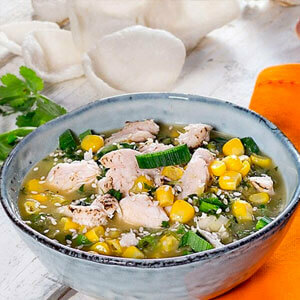 Hang on a second, fully loaded SOUP packed with protein, low in fat, free from artificial additives and crammed with flavour? Our new Teriyaki Chicken Noodle Soup is exactly that! Soybeans (12%), wheat [Flour], Ginger, Concentrated Chicken Bouillon [(61%) (water, Chicken Extract), Salt, Yeast Extract, Chicken Fat (4.9%), Flavourings, Vegetable Juice Concentrates (leek, Onions), Gelling Agents (xanthan Gum, Locust Bean Gum)], Rice Wine, Coriander Leaves, Garlic, Toasted Sesame Oil (Sesame), Sesame Seeds. There's a storm coming Mr. Wayne, and you and your friends best be ready for the OLIVELUTION! 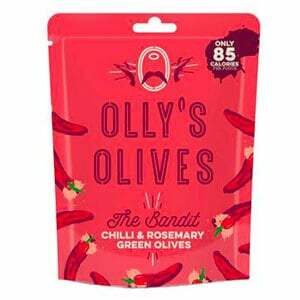 Yes Muscle Food Foodies, we listened to your pleas and searched high and low for some tasty, juicy olives that don't come with a load of unnecessary preservatives like the ones touted in so many supermarkets. Cooked Pasta (43%) [Water, Non Egg Pasta (Durum Wheat Semolina)], Tomato Sauce (26%) [Passata, Onion, Mascarpone Cheese (Cream (Milk), Acidity Regulator: Citric Acid), Garlic, Balsamic Vinegar (Red Wine Vinegar, Concentrated Cooked Grape Must), Salt, Black Pepper], Red Peppers, Chorizo (7%) (Pork, Salt, Garlic, Sweet Paprika), Chickpea Basil Crumb (5%) (Chickpeas, Basil). Manufactured on a site that handles gluten, egg, fish, crustaceans, sesame, peanuts, soya, milk, nuts, mustard, celery and sulphites. 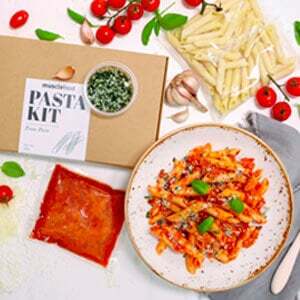 Our Tomato and Chorizo Pasta Kit takes the fuss out of whipping up a nutritious meal. Spicy chorizo is combined with peppers, pasta and a creamy tomato sauce which is all put together in minutes - there's no mess and no hassle. Each pack contains chorizo, pasta, peppers, sauce and a delicious chickpea crumb to top off the dish. All you need to do is combine the ingredients and get stuck in! Cooked Pasta (47%) [Water, Non Egg Pasta (Durum Wheat Semolina)], Tomatoes (31%), Lemon Chicken (19%) [Chicken (90%), Lemon Juice Concentrate With Water, Garlic, Salt, Cracked Black Pepper, Thyme], Black Olive Grissini Crumb (3%) [Black Olive Grissini (Wheat Flour, Black Olives, Black Olive Pate (Black Olives, Sunflower Seed Oil, Salt), Extra Virgin Olive Oil, Vegetable Fat (Coconut), Natural Yeast (Wheat flour), Yeast, Salt, Sunflower Oil, Malted Wheat Flour, Rosemary Extract), Parsley]. 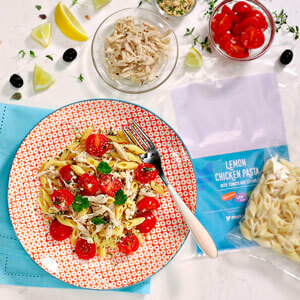 Rustle up a quick, delicious midweek meal thanks to this Shredded Lemon Chicken Pasta Kit. Succulent lemon chicken combines with tomatoes, pasta and crumb topping to give you a delicious dish that's ready in minutes - no mess and no fuss. 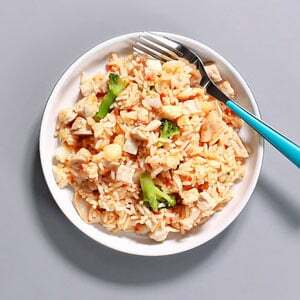 Low in fat, low in sugar and high in protein, it gives you a tasty pasta and chicken combination without busting your healthy eating plan! Chicken (42%), Red Thai Sauce (42%) [Reduced Fat Coconut Milk (13%) (Coconut Extract, Water), Onion, Water, Greek Yoghurt (Pasteurised Skimmed Cows' Milk, Live Active Yoghurt Cultures (L. Bulgaricus, S. Thermophilus, L. Acidophilus, Bifidus, L. Casei)), Coconut Palm Sugar, Red Thai Curry Paste (Garlic, Dried Red Chilli, Lemon Grass, Shallot, Salt, Galangal, Shrimp Paste (Shrimp (Crustacean), Salt), Garlic, Ginger, Tomato Puree, Lime Juice, Salt, Coriander Leaves, Basil, Kaffir Lime Leaves , Gums. ], Peppers (11%), Onion. Thai Curry without the hassle. Sound too good to be true? Not anymore! 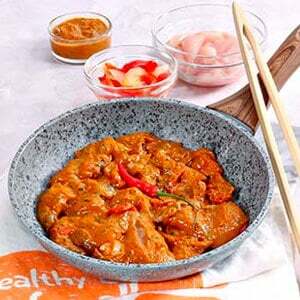 This Red Thai Chicken Curry, new from musclefood, is set to change up your dinner time routine. 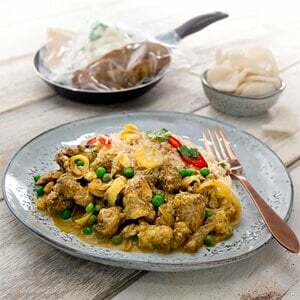 Each pack contains everything you need to whip up a tasty Red Thai curry, with succulent chicken breast, a bag of vegetables and a fragrant red chilli and coconut sauce. All you need to do is combine the ingredients in a pan before tucking in! 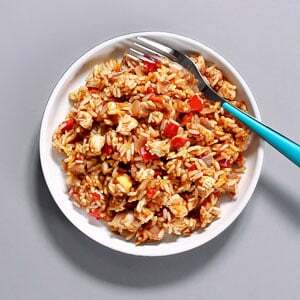 Potato, Chicken Breast, Green Peppers, Red Onion, Honey, Tomato Purée (Tomato Puree, Acidity Regulator (Citric Acid)), Malt Vinegar (Malt Vinegar (Barley, Corn Malt), Diluted With Water To 5% Acidity). 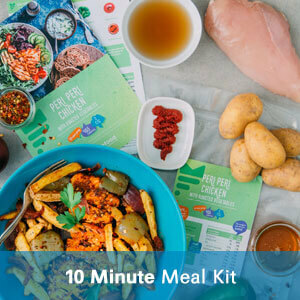 Take the hassle out of cooking a nutritious meal with this Peri Peri Chicken with Wedges and Roasted Vegetables Recipe Kit. Brand new to Do The Unthinkable, this kit includes all the ingredients you need to cook up a delicious meal, with a recipe card to make the process even easier. Each pack comes with perfectly proportioned ingredients for one, leaving you with no waste, no fuss and minimal preparation. Potato, Carrots, Extra Lean Pork Sausages, Courgette, Red Onion, Red Hot Chilli Ketchup (Tomato Puree, Raw Cane Sugar, Brandy Vinegar, Salt Not Iodate, Spices, Starch, Acid: Citric Acid, Preservative: Sorbic Acid), Chicken Stock Cube (Wheat Flour (with Added Calcium, Iron, Niacin, Thiamin), Salt, Dried Glucose Syrup, Flavour Enhancer (Monosodium Glutamate),Yeast Extract, Flavourings, Chicken Fat (3%), Potato Starch, Sugar, Concentrated Chicken Extract (2%),Colour (Ammonia Caramel)), Rosemary. 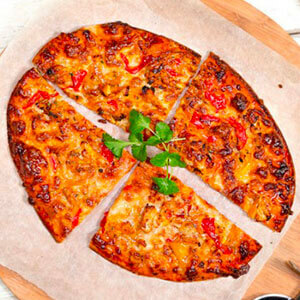 Take the hassle out of dinner time with this Sticky Red Chilli Sausage Bake Recipe Kit – new from Do The Unthinkable. 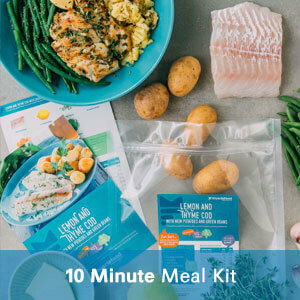 This kit provides everything you need to whip up a quick, healthy meal that is packed with flavour. 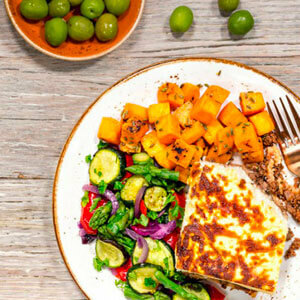 Each pack includes perfectly proportioned ingredients for one - leaving you with no waste – and a recipe card that makes it easy to rustle the dish up with minimal preparation. Pizza Base (49%) [Water, Gluten Free Blend (Tapioca Starch, Rice Flour, Maize Starch, Psylium Husk Powder, Sugar, Buckwheat Flour, Thickeners (Xanthan Gum, Hydroxypropyl Methycellulose), Salt), Pea Protein,Rapeseed Oil,Egg, Yeast], Tomato sauce (17%) [TomatoPuree, Water, Salt, Sunflower Oil, Acidity Regulator (Citric Acid), Herbs, Garlic], Mozzarella Cheese (17%) (Mozzarella Cheese (Milk), Modified Potato Starch), Goats Cheese (5%) (Milk), Roasted Red Peppers (5%), Spinach (5%), Caramelised Red Onions (2%) (Red Onions, Brown Sugar, Red Wine Vinegar). Made with our revolutionary protein pizza base and fortified with pea protein, this has everything you could possibly want from a pizza with NONE of the badness. 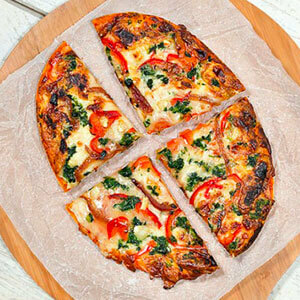 The latest addition to our fancy shmancy Diet Pizza range, this 10 inch oval pizza wonder is a triumph for pizza lovers everywhere because you can finally indulge guilt free. Thai Spiced Chicken with Green Beans, Mixed Peppers and Onions, ready to cook straight from bag to pan. Convenience 1. Waste ZERO! 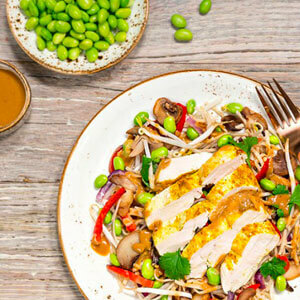 We've transformed the face of healthy eating with this perfectly portioned Thai Chicken Easy Cook Stir-fry for one as it contains everything you need for a healthy, hearty meal. Potato, Cod (Fish), Green Beans, Lemon, Garlic, Thyme, Butter (Milk), Olive Oil. 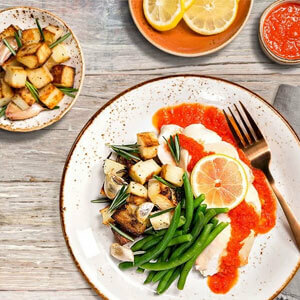 The Lemon & Thyme Cod with Crushed New Potatoes and Green Beans Recipe Kit makes it simple to rustle up a quick, nutritious meal. 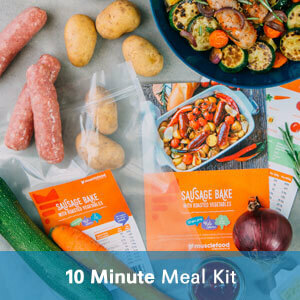 Exclusive to Do The Unthinkable, each kit comes with everything you need to put together a delicious feast without the hassle, including the ingredients and a handy recipe card. The kits include pre proportioned ingredients for one person, leaving you with no waste, no fuss and minimal preparation. 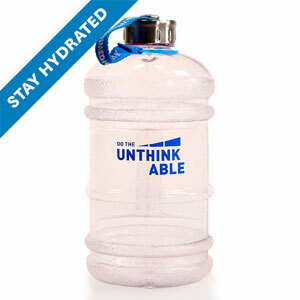 Hydration is the main KEY to reaching your personal goal! You can add a product to your order by changing the quantity below.